For today’s Flannel Friday I have a prop/flannel hybrid. The plan is to sing Spider on the Floor by Raffi and True Kelley while moving my laminated spider to the different parts of my body along with the song. Haven’t decided yet if I’ll hold the book at the same time or just sing it. 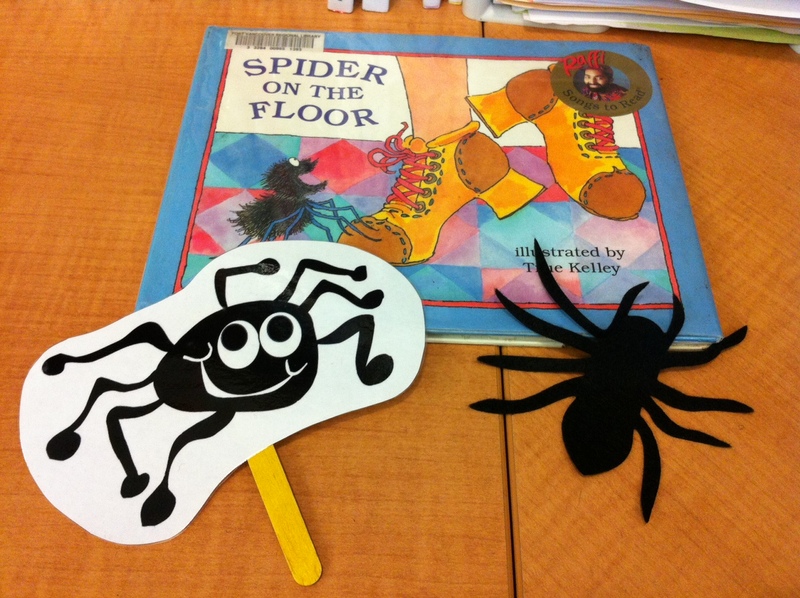 Each family will get flannel spiders (yay for die cut machines!) and I’ll ask them to follow along by putting the spiders on their legs, stomachs, etc. as we go through the song. I’ll do it in toddler storytime next week. It’s simple, but I think it will be a lot of fun! Happy 2nd Birthday, Flannel Friday! Mel has the round up today as she is the founder of this magnificent group. If you want to know more about Flannel Friday click here or join the Facebook group! Really cute idea, thanks for sharing. I’ve done this song with a (Folkmanis, I think) spider puppet I have and it was awesome. I like the idea of giving kids diecuts to play along too. I love this song! Your die cuts are really cute! Like mrsshaia, I use the plastic spider rings. Tie a 2 foot piece of yarn to each of them before handing them out and they have a fun, creepy little bounce as they make their way up the kids’ bodies. That’s a really fun idea! I like the idea of all those spiders bouncing around. 🙂 thanks!